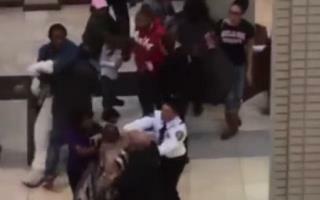 (Newser) – A New Jersey mall Easter bunny who got into a scuffle with a father last month has had a criminal charge against him downgraded, the AP reports. According to NJ.com, authorities say Juan Jimenez-Guerrero attacked Kassim Charles, who had been playing the role of the Easter bunny, when his toddler slipped from a chair while getting her photo taken. A video posted online shows the two men exchanging punches at the Newport Centre. Sounds like he shouldn't have been charged at all. What was he supposed to do? Take a beating? Silly people acting out in public.